Radhames Aracena was born on May 13th 1930 in Santiago de los Caballeros, in the Cibao region of the Dominican Republic. When Radhames was still a young boy, the Aracena family moved to the nation’s capital (which was called Ciudad Trujillo at the time.) When he was 18 and still in school, Radhames met Homero Leon Diaz, director of radio HIZ La Voz del Tropico, and asked him for a chance to work as a broadcaster. Within just a few years later, Radhames became a popular radio personality. His show was called ‘La campana comercial’ (‘The Commercial Bell’) and aired every Sunday from 2pm to 4pm. He played one hour of uninterrupted music, followed by a whole hour of commercials. He charged very little for air time and his sponsors were mostly small neighborhood businesses. His audience didn’t mind listening to their lively commercials, and often stayed tuned the full hour until the next show came on. Radhames’ changed the name of his show to ‘El Canal 0’, and later when he moved to another station, Onda Musical, the show was called ‘El 7 a 8 del Mejoral’. He was known as ‘Charming Radhames’, and was one of the most popular radio personalities on Onda Musical. In 1955, after obtaining local distribution rights for Pedro Infante’s Mexican record company, Peerless, Radhames opened a small record store near El Conde (Santo Domingo’s most fashionable shopping street.) The store, located in the partitioned living room of a house that belonged to an elderly widow, was called Discos la Guarachita (diminutive of guaracha, a popular type of Cuban music.) He also borrowed an old record player so that customers could listen to music while they were browsing through the store. Discos la Guarachita was a success, and Radhames was able to secure distribution rights for other Latin American record labels, including Panamerica de Discos, which controlled the catalog of the famous bolero singer Lucho Gatica, and Discos Fuentes, a Colombian label which controlled the music of Julio Jaramillo, Olimpo Cardenas, Duo Villafuente, Los Pamperos, and others whose guitar based music was popular in the Dominican Republic. Radhames then obtained distribution rights for even larger international labels including RCA and CBS. Four years after it opened, Discos la Guarachita moved to a large storefront directly on Calle el Conde. In 1959, the same year that Radhames moved his store to El Conde, the Trujillos established a record pressing plant in the Dominican Republic, and thereafter made the importation of foreign records illegal. Aracena, in a move that saved his business, placed a pinball machine in his store. This provided him with a critical source of income while the importation restrictions were in place. Around the same time, Radhames began to experiment with recording local bands with a simple setup consisting of a microphone and commercial tape recorder. While Trujillo was in power, his family and associates maintained near total control over the music that was recorded and broadcast in the Dominican Republic. The authoritarian choke hold on music relaxed in 1961 after Trujillo’s assassination. In the upheaval that followed, Radhames paid bargain basement prices for the equipment and license to launch a new radio station. He established the legendary Radio Guarachita in 1964, and after a year of trial an error, the station launched on the 690 AM Frequency. Radhames set up his enterprise in a two story building: the top floor was for the studios of Radio Guarachita, as well as a radio-theatre which could hold 150 people and transmit live shows. The main cabin was open to the public, creating an interactive experience for the people that stopped by. On the lower level, there was a shop selling electronic products, mainly parts to repair radios and televisions. At first, Radhames’ radio show played imported Mexican and Cuban music in order to boost sales from his record store. But he soon realized that his audience, which consisted of low and middle class immigrants from the rural areas, preferred the music of local artists, regardless of its poorer sound quality. So he abandoned the idea of producing a ‘refined’ Colombian-style radio station, and committed his programming increasingly to the domestic guitar music that has since come to be known as bachata. Although Radhames was among the first to give bachata air time, there were others before him. Two of the best known were DJs Cuco Valoy (who later became an internationally famous salsa and merengue singer) on Radio Tropical, and Jose Tabar Asilis (popularly known as Charlie-Charlie) on La Voz del Tropico. But Radhames, with his far reaching AM station, was the most influential in broadening bachata’s exposure. Around the same time as he launched Radio Guarachita, Radhames also became more serious about recording music. He made his first commercial records on equipment designed for radio advertisements. These were among the first bachatas recorded, but their sound quality was abysmal. After a 1962 session with Jose Manuel Calderon, Radhames is said to have been too ashamed to even allow the artist to listen to the result. But realizing the demand for local music, Radhames was determined to produce recordings on par with the quality of the imported records he sold in his store. Radhames purchased new equipment and soon became one of the leading sound engineers in the bachata industry. He presided over the recording and mixing of each session, and even designed the record covers. Bachateros would gather outside his house every Saturday morning in hopes of a chance to record. Some of the first musicians he worked with were Los Hermanoz Veloz, Inocencia Cruz, Fabio Sanabia, and Jose Manuel Calderon. These early bachateros often recorded Dominicanized covers of songs by the same foreign artists that Guarachita at first promoted. Radhames vertically integrated his business by opening a pressing factory, Fabrica de Discos la Guarachita, where he manufactured for his labels, as well as for other local producers. Radhames Aracena and Empresas Guarachita (Guarachita Enterprises), now owned a record store, recording studio, pressing factory, two record labels (‘Discos Guarachita’ and ‘Zuni’, named after his wife Zunilda), and a national radio station. He was in total control of the music he produced, and had an overwhelming advantage over other local bachata producers. 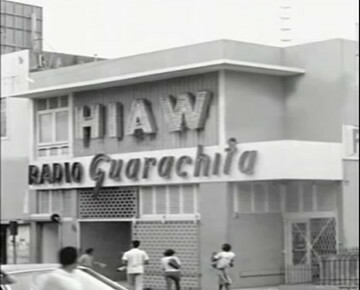 In addition to music, Radio Guarachita had interactive programs where listeners could phone in, and where the announcer would read on air listeners’ mail and telegrams. These ‘public service’ functions helped Radio Guarachita gain a loyal fan base. Listeners living in rural areas and recent migrants to the city depended on the radio station to keep in touch with each other. They could call or send in a telegram at any hour of the day, and it would be read on the air. In an era before telephones were widely available in the Dominican Republic, these 24/7 public announcements encouraged listeners to stay tuned all day, on lookout for any important news. It was common, for example, for a person to come to Santo Domingo in search of a family member whose address was unknown. He or she might stop at Radio Guarachita, and have the DJ invite the family to meet at the station. Guarachita became a fixture of life for a large segment of the Dominican population. Radio Guarachita gave many legendary Dominican artists their first break. Jose Manuel Calderon, Leonardo Paniagua, Blas Duran Ramon Cordero and Edilio Paredes, are some among the host of traditional bachateros whose careers were launched by Radhames. Many popular merengue tipico musicians, including Tatico Henriquez, Dionisio ‘Guandulito’ Mejia, and Fefita La Grande, also recorded important works with Guarachita. It wasn’t always smooth-sailing, however. There was (and still is) controversy regarding Radhames’ treatment of the artists on his label. Session musicians Edilio Paredes and Joan Soriano recall being forced to remove their shoes in the Guarachita studio (which occupied a floor of the Aracena household), and to work 12 hour shifts barefoot and without being fed. The recording agreements that Radhames made with his artists have also been called unfair. Their honorariums were meager; many believe that they deserved more, and there continue to be allegations that royalties have not been paid to family members of deceased artists. And Aracena had no qualms about stealing other people’s songs: if a song by a non-Guarachita artist became popular, Aracena would often re-record it with one of his artists, in hopes of usurping the hit. In the 1980s, Radhames for instance repeatedly re-recorded Juan Bautista’s songs with Jose Manuel Felix, ‘El Solterito del Sur’. Because of Guarachita’s dominance of radio, many of Bautista’s hits became better known through El Solterito’s interpretations. However, it is undisputed that Guarachita helped to launch many successful careers, and so even while feeling exploited, Guarachitas’ artists often express gratitude to Radhames as well. Years passed and bachata evolved. In the 1990s, bachata musicians began recording with electric guitars. The media’s boycott eased as bachata gained more acceptance across social strata and the Dominican diaspora spread bachata throughout Latin America. Sophisticated record labels from abroad began to take an interest in bachata, creating a kind of competition that Empresas Guarachita had never experienced before. In an attempt to keep up with the times, Radhames made the move from AM to FM, and thereafter Radio Guarachita’s reach was limited to Santo Domingo, losing its nationwide audience. Radhames Aracena passed away on December 11th 1999, at the age of 69, and his beloved Radio Guarachita was closed after its heirs sold it to Dominican businessman Juan Lopez. When a person in the Dominican Republic turns the dial to 690 AM, they are now serenaded by ESPN radio. Many former Guarachita artists continue to be active today, and Radhames’ mark is still felt. Musicians that have collaborated with Guarachita include Antony Santos, Luis Segura, Leonardo Paniagua, Rafael Encarnacion, El Chivo Sin Ley, Eladio Romero Santos, Jose Manuel Calderon, and countless more. Even in his last years, Radhames persisted with his efforts to innovate. He died leaving a host of unfinished projects, some of which were ahead of their time. Among his last and never released recordings were “Su lado de cama” by Joan Soriano, and an album of Creole language bachatas. These recordings have been lost, but iASO Records has re-initiated the projects, releasing “Su lado de cama” in 2010, and the first commercially available Creole language bachata “Cheri Amou” in 2014. Cuantos recuerdos hermosos de la época. El los campos de Loma de Cabrera era un toque de queda el Programa "Lo que el público pide" que se transmitía en horas de la noche. Gransorpresa encontrar un texto tan bien documentado. Guardo recuerdo de Rhadamés y sus hermanas a quienes conocí en el Instituto de los Silié. Recuerdo vivbamente cuando Rhadamés me llamó para anunciar que había obtenido el teléfono 2-3456, número obviamente singular y atractivo, para La Guarachita. Le recuerdo como buen amigo y colega de la radido. estos acontecimientos deberían pasar a la historia de la música dominicana, especialmente la Bachatas. Este lugar debio ser un museo de arte.